Makeup capes are considered one of the most important items to be used in a salon. As a salon artist, it is important that you protect and cover your client from any spillage that might occur during makeup session. There can be instances of spillage when you apply makeup on them. What comes to the rescue in such cases? Salonwear makeup cape, of course! At Salonwear, we have elegant makeup artist capes available at your disposal. Salonwear provides you with top-quality makeup capes that are both comfortable and reliable. What are we offering in Makeup Artist Capes? 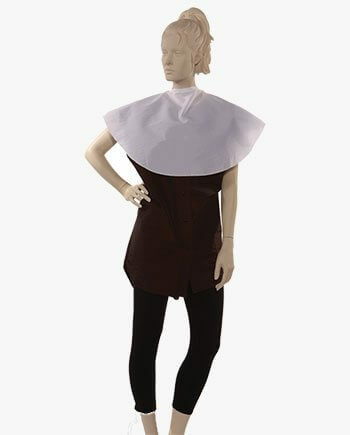 Salonwear’s lightweight makeup artist smock has an ideal length for your clients. This cape is great not only for makeup application but also for hairstyling. With many years of experience in the spa and salon apparel and accessories industry, Salonwear delivers nothing but the best of makeup capes available in the market. The makeup capes we offer are not only functional but are also attractive. The top quality design of makeup artist capes provides ease of movement. We aim to provide your salon with admirable makeup artist smocks so that you and your salon staff can focus on providing excellent makeup and hair styling, without worrying about spillage. Apart from makeup capes salonwear also offers a wide range in other types of capes such as printed capes, hair salon capes, capes for kids, super capes, wholesale waterproof capes and many more. Our makeup capes are made of Lightweight Crinkled Nylon Fabric of exceptional quality. The cape is available in a classic white color. The Salonwear Lightweight Crinkled Nylon white makeup cape is an excellent choice as it reflects the right lighting on your client’s face for makeup application. Our makeup cape is durable and easy to manage, making it one of the best makeup capes available in the market! Apart from the various spa and salon apparel and accessories we offer, we also help you in creating an identity for your salon that is unique and exceptionally good. We do this by personalizing uniforms and apparel with your spa or salon’s logo. This would also instill a sense of professionalism among your team members. These makeup capes personalized with logos use two high-quality techniques: Screen Printing and Embroidery. Our customized makeup capes will help to improve your brand awareness. Why choose Salonwear for Makeup Artist Smocks? We have been a distinguished market leader in the salon and spa apparel and accessories industry in the US for the last 31 years. We are trustworthy partners for spa and salon wear. We believe in delivering high-quality products and exceptional designs that are chic and modern. We are a one-stop solution for all your spa and salon wear needs. Although Salonwear started as a family business, now with many years of experience in this industry, Salonwear has the right knowledge of the customers’ ever-changing requirements. With our hard work and excellent service, we have a large family of happy and loyal customers.